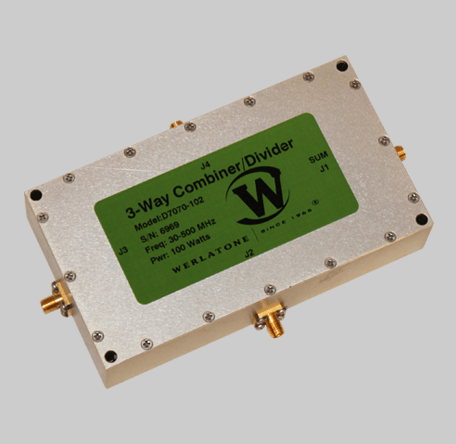 The Model D7070 is a compact, 3-Way Combiner/Divider, which covers the full 30-500 MHz band and is rated at 100 W CW. The D7070 operates with less than 0.75 dB of Insertion Loss and better than 20 dB of port-to-port Isolation. The D7070 measures just 5.4 x 3.0 x 1.31" and weighs approximately 2 lbs. The Model D7070 is a compact, 3-Way Combiner/Divider, which covers the full 30-500 MHz band and is rated at 100 W CW. The D7070 operates with less than 0.75 dB of Insertion Loss and better than 20 dB of port-to-port Isolation. The D7070 measures just 5.4 x 3.0 x 1.31″ and weighs approximately 2 lbs.